Sleeping on a plane was never something I could do well. I could cope with the noise from the engines and the dry air in the cabin, and I would often take a mild sleeping pill on flights longer than ten hours, but even then, I would wake up each time my head tipped forward as I fell asleep. I applauded new seat designs which featured side flaps on the head cushion. It helped a bit as I could rest my head against either flap but nothing stopped my head from falling forward and they didn’t prevent neck aches after a long flight. I tried inflatable neck pillows but that didn’t help either – they were uncomfortably hard and didn’t support my head sufficiently. As a consequence, sleeping well on a plane was always a challenge for me. How to sleep well on a plane: the plane pillow that works! All that changed when I was approached by the lovely Gemma Jensen with her new invention: the J-Pillow. The thing that struck me right away was its ingenious design. Roughly in the form of the letter ‘J’, the pillow supports the head, neck AND chin. That means my head would never fall over and I would never have another neck ache. It sounded too good to be true! Gemma sent me the J-Pillow for a review and I’ve since used it on numerous long-haul flights. My verdict: I’ve never slept better on a plane! I had a good laugh when I first received it. I noticed it’s ‘J’ form but it also reminded me of a body part closer to home. *wink*. The filling was sturdy for good support whilst the pillow’s velvety cover provided a soft, luxurious feel. I first tested it at home, on my couch. One thing was certain: this pillow was made to cradle a head like a baby. One flap formed a plush cushion behind my head. I leaned my head against the other flap with the tail of the ‘J’ tucked beautifully under my chin. There was no way my head would fall over as the tail gently supported my neck and kept my head upright. I brought it onto the plane with me, squashed into my hand luggage like a ball. As soon as I took it out, it bounced back into its original shape. I found other uses for it on the plane: I used it as a cushion for my lower back and as a head cushion while I watched a movie. 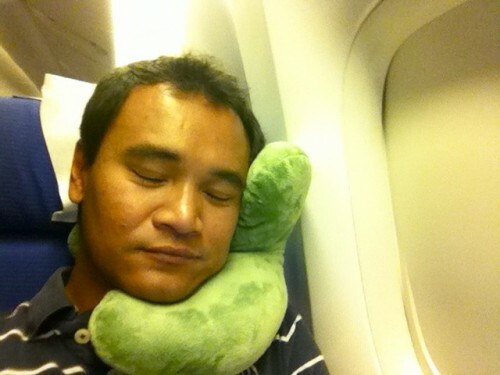 On my first flight with the J-Pillow, I slept for seven hours straight without waking up once! That was a whole new experience for me! The J-Pillow truly is a brilliant invention – THANK YOU GEMMA! – and one I can recommend without any hesitation. It’s no surprise to me that it won the ‘Best British Invention 2013’ award in the consumer category. The J-Pillow is not only perfect for travel, it’s also great for home use (I’m thinking, a quiet evening on the couch with a glass of wine and a movie). However, most importantly, thanks to Gemma, I now know how to sleep well on a plane! Note: J-Pillow provided the product for my review. As always, opinions expressed above are mine, and mine only. You can get the pillow via Amazon. Where can I get the pillow! I would order the J-Pillow online. If I understand correctly, they offer free shipping to Australia. I read with interest that you can purchases the J pillow in Singapore. Can anyone please tell me which store? I’m travelling to Paris from Perth Australia via Singapore and MUST have one of these wonderful pillows. I always had that problem too and the J-Pillow works very well. Glad you’re enjoying your J-Pillow. I still use mine on long-haul flights. I forgot to take it with me on one of my last flights and I had difficulty sleeping without it! A sitting cushion would indeed be a welcome addition! I have to agree with you Keith. I bought a J Pillow a few months ago and apart from its unusual shape it really does the job well. I’ve used it on 4 long haul flights already, 2 of which were more than 13 hours long one way. Not a hint of neck ache afterwards so I am really happy. I just need to find a suitable sitting cushion now since the uncomfortable sleeps rather than my head position are now factors affecting my sleeping on a plane. That’s a very interesting pillow and comfy too! I gotta have that for my travels. Thanks for sharing Keith! This pillow looks great Keith, the design looks perfect to avoid neck ache during long trips. Sleeping while traveling has been a problem but now looks like this new product will make long journeys more pleasant. Wow! A very good neck pillow. This is the first time I’ve seen this kind of pillow. I like it! Thank you for posting – this pillow looks like a dream! Finally an answer to my sleeping woes in the plane. Gotta get me one of these. I have to say that this is very innovative. Never heard of the J-pillow until I have read it here. I might buy this because I fly frequently. Keith this colour suits you! 🙂 Would love to have a pillow like that- looks very comfy and cuddly. I’ve got a great plane pillow that I bought at Singapore Airport. It’s an OSIM Neck Pillow and it clips closed at the front so your head can’t roll forward. It also has a vibrate function to massage your neck. I don’t get on a plane without it. Thanks Arian. I wondered the same too! It’s the simple things/ideas that really work. Amazing! Why has this never been done before?! Such a great design, and your face says it all! Thanks Linda. That’s what I love about the J-Pillow: it’s not a hard inflatable pillow but rather a comfortable cushion that’s sturdy enough to support my neck, chin and head. I love a great travel pillow. To me the secret of a good neck pillow is that the back of it does not fill with air. Then you can let your head fall to the side (as it does naturally when you are sitting up straight) and be supported. Was very much struck by your photo. This is definitely the ideal pillow for a window seat. Oooh the J-Pillow looks like a good friend to travel with and love your happy face! You can squeeze it tight into a ball – not sure how to explain its size but it fit easily into my small backpack. It also has a loop attached to it so you can hang it on a bag instead of packing it. Hope this helps.